This year has already seen a number of significant changes to benefits, and there are more welfare policy updates on the way. Whilst most were unveiled in the 2018 Autumn Budget, some changes were announced as recently as this month. With local authorities already grappling with funding cuts, Brexit uncertainty and the transition to Universal Credit, there are scant resources left to prepare for and potentially benefit from oncoming policy changes. Yet, by using household-level data to identify the impact of these policies and target resources accordingly, there are a number of ways councils can protect vulnerable residents now. In June 2018 the government announced that people receiving the Severe Disability Premium (SDP) within their income-related benefits would not be moved onto Universal Credit until transitional protection became available. This move was in response to concerns that these households are some who will lose the most as they migrate to Universal Credit. This is because legacy benefits contained a range of additional premiums for those with disability which have not been replicated in Universal Credit. In certain cases, such as where somebody has a disability but is not ill and therefore judged fit for work (or work-related activity), the loss of the SDP is not replaced by any additional amount in Universal Credit, leaving these households with a significant income shortfall. In our analyis of the 2018 Autumn Budget, we found that 88% of households in receipt of disability benefits and some income-related legacy benefits would be worse off once they move onto Universal Credit and any transitional protection has ended. As the graph below shows, the average low-income household in receipt of disability benefits will be over £50 a week worse off under Universal Credit, even after the Chancellor’s 2018 Budget changes are factored in. The announcement stipulated that, from 16 January 2019, no households in receipt of the SDP within their income-related benefits will be moved onto Universal Credit. This would be the case even if that household experienced a change in circumstances that would ordinarily trigger a Universal Credit claim. Since this announcement, in areas where legacy benefits claims were still possible, local authorities have worked hard to ensure new claims for income-related benefits which could include the SDP were lodged before full-service Universal Credit reached all Jobcentre Plus areas (December 2018). This was effectively the last chance for these households to claim before their application is automatically considered for Universal Credit. What can local authorities do now? Now that the change is in effect local authorities can focus on households with existing claims for income-related legacy benefits where an SDP is not, but potentially should be, being paid. As well as boosting household incomes significantly, given that the SDP could be worth up to £6,687 per annum per household, it would also “future-proof” these households by ensuring that they’re not moved onto Universal Credit (and face the payment delay and potential fall in income) until transitional protection is available to them. Using existing Housing Benefit and Council Tax Reduction data, local authorities can identify households not currently receiving the SDP and who may be eligible. Typically we find there are no more than a few hundred such households so council staff may be able to contact them individually and offer one to one support. KEY ACTION: Ensure all households eligible for the Severe Disability Premium (SDP) are claiming this as part of their income-related benefits, so that they remain on legacy benefits until transitional protection is available. Since April 2017 the two-child limit has restricted the amount of Child Tax Credit (CTC) that some families can receive. Parents who made or updated a claim for CTC since this date, and who had a third or subsequent child after 6 April 2017, have only received this benefit for their oldest two children. Previously, parents were able to claim it for all of their children, regardless of when they were born. Data from the Family Resources Survey (FRS) that Policy in Practice has analysed shows that, as of 2015/16, 2.3m families with two or more children were in receipt of CTC, and are therefore at risk of the two-child limit if they’ve had another child after April 2017. The graphic below shows the income shortfall that families affected by the two-child limit are expected to experience. It was also announced that the measure would apply to the child element under Universal Credit, but with one crucial difference. For third or subsequent children, regardless of whether or not they were born after 6 April 2017, no child element will be paid to the parents. In other words, all families with 3 or more children would lose a significant amount of income once they were moved onto Universal Credit. However, since Universal Credit has not been available for families with 3 or more children to claim, this aspect of the two child limit has not yet come into effect. Any large families making new claims for benefits after April 2017 would have made a claim for Child Tax Credit and not Universal Credit (albeit with a few exceptions), and would therefore have any caps applied in relation to their children’s ages, as outlined above. From February 2019 onwards, however, Universal Credit will accept claims from families with three or more children. Families with three or more children claiming benefits will now make a claim for Universal Credit, and face the retrospective application of the two-child limit regardless of when their children were born, for the first time. In January Amber Rudd acknowledged that this would unfairly penalise families who decided to have three or more children before the two child limit was conceived. She announced that the two child limit will not now be applied retrospectively once larger families begin to claim Universal Credit from February onwards. A family with three or more children will continue to receive the same amount within the child element within Universal Credit, for all children born before April 2017. This is a welcome change and means that Universal Credit will be more generous to larger families than previously expected. However, many families with younger children will still be affected by the two-child limit and therefore face receiving less income for their children than they would have previously. Using monthly Housing Benefit and CTR records, local authorities can identify which families had their third or subsequent child after April 2017. These families would not have received Child Tax Credit for their youngest child, and may be at risk of financial problems. Combining these datasets with other measures of financial vulnerability local authorities can identify families at greatest financial risk, and direct targeted support where it is most needed, and likely to be most effective. KEY ACTION: Identify households in receipt of Child Tax Credit (or the child element of Universal Credit) whose third or subsequent child was born after April 2017, who will only receive support for their eldest two children. They may be at risk financial crisis. Target support to them. In the 2018 Autumn Budget, the Chancellor Philip Hammond announced that many people claiming Universal Credit would benefit from a £1,000 a year increase in work allowances, as part of a £1.7bn injection into Universal Credit. In our analysis of the budget we estimated that this would positively affect 1.9m households with children and a further 0.6m with limited capability for work. Overall, we found that this measure, combined with the impact of a higher National Minimum Wage and personal tax allowance, would increase the average income of people receiving benefit support by around £6 per month, as shown below. However, average incomes will still be lower than under legacy benefits, with around 40% still seeing their income fall under Universal Credit. Plus, some household types will see little benefit from the Budget announcements, or insufficient benefit to cover the loss in income they could experience as they transition. Lone parents and home-owners in receipt of tax credits only, for example, are likely to benefit from increased work allowances, but both groups are still expected to receive less income on average under Universal Credit (excluding any transitional protection that they might receive). Self-employed households will also see little benefit from the increased work allowances, although the Budget helped them by introducing a 12 month grace period before the minimum income floor is applied. This is effective from July 2019, see point 5 below. Given the uneven impact of the increased work allowances, local authorities will want to identify people who are still expected to see an income loss, and take appropriate action. Because transitional protection doesn’t start until managed migration comes into effect in 2020, households that make a Universal Credit claim today won’t receive any transitional protection if they’re worse off under Universal Credit and could struggle to cope financially. Local authorities can identify and contact these households while they are still receiving legacy benefits, alert them to their situation and explore ways to build their financial resilience, in case they move onto Universal Credit before transitional protection is available. KEY ACTION: Focus resources on building the resilience of households on legacy benefits for whom Universal Credit is considerably less generous, and for whom the higher work allowances announced in the 2018 Budget (coming into effect in April 2019) make little or no difference. From May 2019 mixed-age couples where the older partner is of state pension age and the younger below won’t be able to make new claims for Pension Credit. Instead they’ll have to claim Universal Credit. Existing mixed-age couples on Pension Credit will not be affected. In other words, from May 2019 new claims for Pension Credit can only be made from couples where both partners are of state pension age. For many mixed-age couples, Universal Credit will be considerably less generous than Pension Credit. And, under Universal Credit the partner who is below state pension age will usually be expected to look for or prepare for work. Local authorities have an opportunity to drive take-up of Pension Credit among mixed-age couples before May. After May, these couples must claim Universal Credit which could mean they receive less income and have conditionality imposed on them. Councils can identify cases where benefits are not being claimed, and target take-up campaigns more effectively. 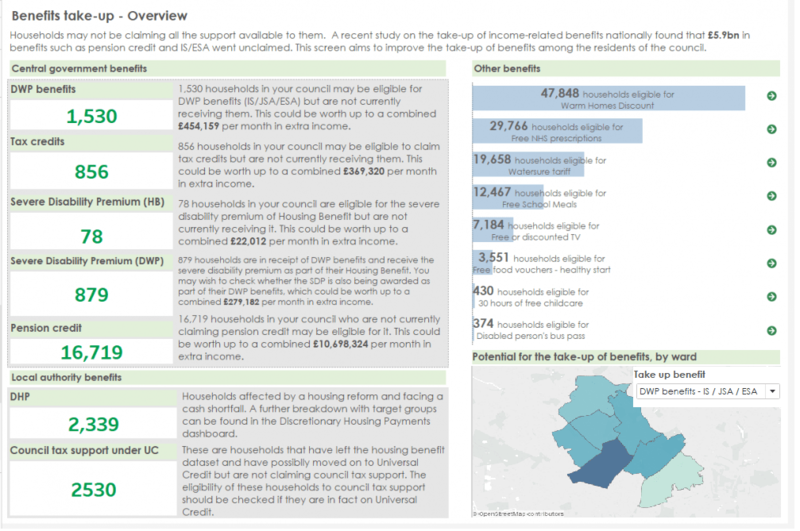 By analysing their existing household-level datasets on Housing Benefit and Council Tax Reduction payments, councils can identify who is eligible now and proactively target them to see whether a claim can be made before May. After this point, councils can use the same datasets to identify which mixed-age couples had to make a Universal Credit claim instead. The income that these households receive through Universal Credit may not be enough to cover the higher caring or disability needs that they may have, and could require financial assistance from the Council to prevent significant hardship. KEY ACTION: Identify mixed-age couples eligible for Pension Credit but not receiving it, and determine whether a claim can be made before May 2019. Reach out to mixed-age couples who claim Universal Credit after May 2019, and who may need more financial help than is covered by Universal Credit. At the moment, it is assumed that self-employed households on Universal Credit earn a notional income, known as the minimum income floor, and their award is calculated based on this. The minimum income floor is, in turn, calculated as the applicable national minimum wage multiplied by the number of hours per week that a particular person is expected to work (typically 16 or 35 hours per week). Effectively, this means that self-employed people whose actual earnings are below the minimum income floor will receive a Universal Credit award that is much lower than what they’d currently receive through the legacy benefits system. Research carried out by Policy in Practice across 20 London boroughs finds that the majority (78%) of self-employed, low-income Londoners earn below the minimum income floor. These households would therefore face significant income reductions if they moved onto Universal Credit. Our analysis into the impact of Universal Credit following the 2018 Autumn Budget finds self-employed households will lose the most. As the graph below shows, even after factoring in the increase in work allowances, self-employed households on low incomes face an average loss in income of £50.86 a week under Universal Credit (excluding any transitional protection). Once the minimum income floor applies, self-employed households are expected to face some of the biggest losses under Universal Credit. In light of this, Chancellor Hammond used the Autumn Budget to announce that from July 2019 self-employed households moving onto Universal Credit won’t be affected by the minimum income floor for the first 12 months of their claim. This is intended as an opportunity for self-employed households with lower earnings to increase their self-employed income, or change economic status. Self-employed households who make a Universal Credit claim before July 2019 could be affected by the minimum income floor much sooner and potentially face a big drop in income. 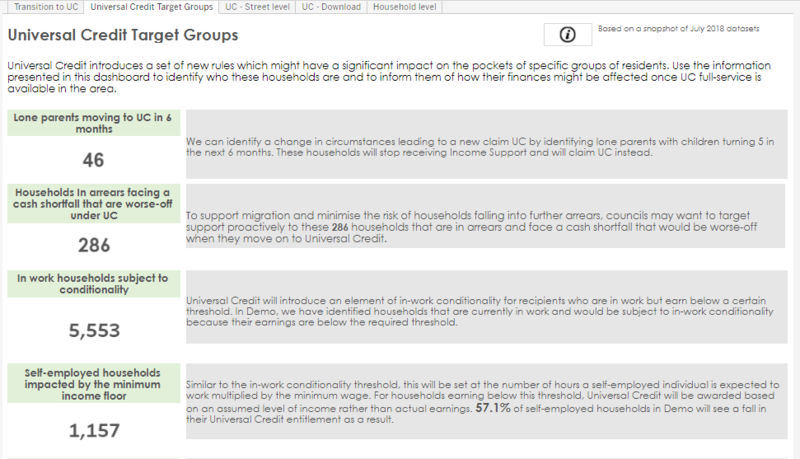 Councils can use their household-level data to identify self-employed households who aren’t yet on Universal Credit and then target information and support appropriately, in order to prepare them for a potential loss in income. From July 2019, local authorities can use their household-level data to identify any self-employed households that move onto Universal Credit, and make sure they’re aware of the 12 month period before the minimum income floor comes into effect. To avoid a potentially significant drop in income, these households can use the 12 months to build their financial resilience. In co-ordination with local Jobcentre Plus offices, councils could contact these households to begin this conversation well ahead of the 12 month deadline, and offer budgeting and employment support where relevant. KEY ACTION: Identify self-employed households not yet on Universal Credit and engage them around the impact of the minimum income floor before it comes into effect. Some of these may decide to wind down their business and seek another form of employment. We work with a number of local authorities to help them identify vulnerability, target support and track the effectiveness of their support using a LIFT Dashboard. Join our next webinar on Wednesday 20 February at 10:30 to hear how our new benefits take up screen is helping one local authority to identify households who aren’t claiming all the support available to them. Find out more and register here. Previous Post A visit to Croydon Council’s award winning Community Connect/Food Stop Next Post Data analytics: Who’s missing out on benefits in your area?